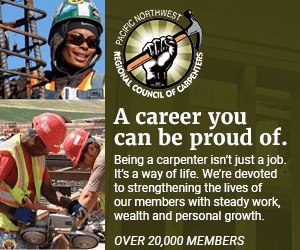 In a community-wide volunteer effort, the National Association of Minority Contractors of Oregon has put together a million-dollar plan to remodel the historic Billy Webb Elks Lodge on Tillamook Street in Northeast Portland. Local business consultant and entrepreneur Faye Burch is helping lead the effort. "The idea came from the NAMCO chapter president, James Posey," she said. "He had conversations with Royce Warren and others from the Elks and they discussed their needs for immediate repairs—James brought it to NAMCO and the members who all feel very strongly that it's important to give back said, 'let's do it.'" Since NAMCO's regular meetings are held at the Elks Lodge, it seemed like a natural community project for the group's active members – who were well aware of the work involved, as well as the importance of the facility to the local neighborhood. Burch said when the contractors started to inspect the building, it became obvious that the lodge needed more than just a few minor repairs. "Our approach to this has been the same formal process as any downtown commercial building," she said. "We are having seismic upgrades, remediation, architecture designs and improvements that keep in alignment with the existing design and first class construction work that everyone can be proud of." Local music promoter Wanda Broadous held two months' worth of fundraisers at the facility last fall, featuring local DJs, musicians and singers. "It's important because it means a lot to a lot of people, the heritage itself means a lot to a lot of people coming up now," she said. "The stories of the founders of the Elks haven't been talked about enough, especially for the young people." "That's a place where a lot of our parents and grandparents went, and we went there as children," Burch said. Originally known as the "colored YWCA," the building's construction in 1926 was made possible by a $12,000 contribution from E. S. Collins, a White woman active in the organization. The first applications for construction were opposed by local citizens who objected to a facility devoted to Black community affairs and socials. The complaints were struck down by the city attorney, who ruled that the race of applicants was not a valid argument for refusing a construction permit. The Lodge was named for Billy Webb, who during the 1920s led an orchestra of African American Elks Club members that played on steamships operating between Oregon and California. The lodge also served as a United Service Organization club for Black soldiers during World War II. The building was managed for years as a community center. Currently owned by the local lodge membership, the building is used for events, birthday parties and wedding receptions. "All of our members are participating at some level," Burch said. "This will give the community a place to go for lunch and meetings, shuttles to Rose Garden activities and Blazer games and more and restore one of the community's valuable assets." NAMCO will work on the effort with Hoffman Construction, CJ Jackson Construction, the Portland Development Commission, IBEW local 48, Walsh Construction, Legacy Health System, Stacy Witbeck General Engineering, NW Natural Gas and others. Contractors for the project will donate their time and labor. The group has organized a Project Management Team and is asking for help with material contributions, new furnishings, flooring and carpeting, restaurant equipment and cash contributions from organizations and individuals to cover additional expenses. "We want people to pitch in," Burch said. "There are many things we need that aren't covered in the budget." The $1 million construction budget has been pulled together from an array of sources, and is bolstered by the pledges of free labor by the contractors of NAMCO. NAMCO's goal is to have the outside of the building and a portion of the inside finished by a kick-off celebration planned for "The Gathering" in late August. "It's wonderful to have a dream of keeping something like this vital in the community, and then to make it come alive," Broadous said. The membership plans to create a picture collage that will reflect the history of the organization. For more information on how to get involved with the Elks Lodge project, contact one of the project partners above, call Faye Burch at 503-936-6898 or James Posey 503-936-0277. Or stop by the Elks Lodge in person at 6 N. Tillamook St. or call Jennifer Dishman at 503-284-4853.